While the majority of poetry shares roots with autobiography, for the poet to focus on a historic figure is a more unusual, but when done skilfully, the results are hugely pleasing. Think magician’s act blended with both anthropology and archaeology, and thoroughly interlaced with respect. In Kierkegaard’s Cupboard, poet Marianne Burton has unearthed and thoughtfully restored a scant horde of treasures from the archives of Danish philosopher Søren Kierkegaard. Throughout she has provided contextual signposts to help us understand the contemplations laid out before us, which support those of us new to Kierkegaard’s meandering preoccupations without intruding on the elegance of the poems themselves. There’s a precision to Burton’s phrasing that shines up for me the image of a man keenly observant yet frequently fogged over by the deep intrigue of his own mind. Presented as a series of 14-line sonnets, the poems range from the yearning to the regretful to the at time bordering on furious, not least when it comes to journalists and others by whom he felt persecuted. Minor miracles such as a friendship with a stream are set alongside verses capturing mundane tasks handled with such care that they seem imbued with wonder. Far from being a history lesson or a wholly accurate pen portrait, these poems gather together to present a hint of the minutiae that make up the layers of a person’s mind, and the sense of having known him intimately, if for only the briefest pockets of time. 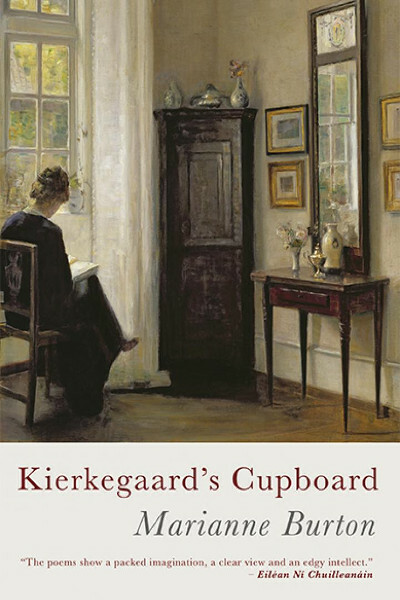 Kierkegaard’s Cupboard by Marianne Burton is published by Seren Books and available to buy from Amazon. This entry was posted in Reviews and tagged Marianne Burton, poetry, Poetry review Kierkegaard’s Cupboard, Seren Books by Judy. Bookmark the permalink.